I am Linda, the Smiling Quilter, who loves to laugh and pun around. Sweet & simple quilt for today. I wondered if you ever ventured this way! Glad you enjoyed it. 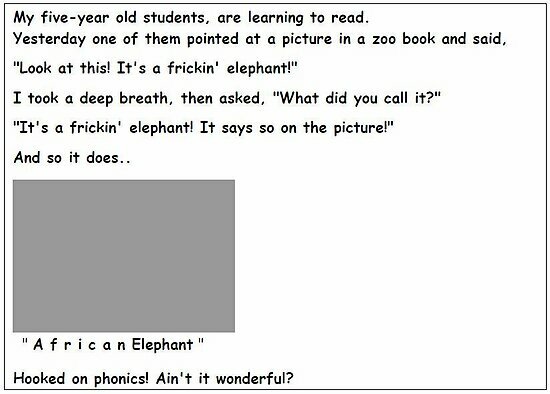 Saw that years ago & still laugh at it. Oh, Honey, out of the mouths of babes. They say exactly what they see and feel. And he was right. You have to hand it to him. And thanks for sharing this goody. I must stop laughing and go load this beauty!!! Laughing with you all the way! Hi Laura! I am so glad to hear from you & glad you have joined in he fun! Too cute, kids say the darndest things! They do indeed. I had five year old once but never students. This came round years ago and I have always kept it for moments like these! LOL Sounds like something I would reason out when I read something new. Kids are great!! LOL. i thought so too.